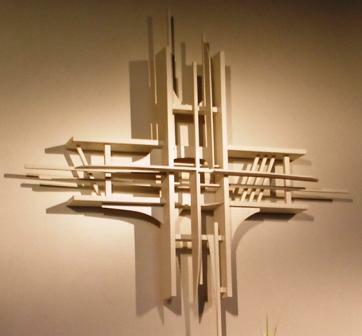 Our cross was designed and built by Richard Caemmerer, Jr., Professor of Art at Valparaiso University. The cross was intended by the artist to “represent the Good Friday event transfigured by the power of the Resurrection.” Mr. Caemmerer built a small model, which was accepted by the congregation, and the cross was built on-site. It was dedicated along with new crosses and candlesticks on September 21, 1969. Mr. Caemmerer went on to co-found the Grünewald Guild of Leavenworth, Washington, whose mission is to awaken the creative spirit through art, faith, and community.